The annual City of Minneapolis Creative City Challenge competition will be sited at The Commons, the new 4.2 acre public green space and an anchor in the Downtown East area transformation for the second year. The Arts, Culture and the Creative Economy Program of the City of Minneapolis in collaboration with The Commons and Northern Lights.mn and the Northern Spark festival, announce the sixth annual Creative City Challenge based on the theme of commonality. The Creative City Challenge is conceived as a showcase for local creative talent: Minnesota-resident architects, landscape architects, urban designers, planners, engineers, scientists, artists, students and individuals of all backgrounds to create and install a temporary, destination artwork, which acts as a sociable and participatory platform for 4 months. Three finalists will receive $2,500 to create full proposals. The winning Creative City Challenge proposal will receive a $50,000 commission to execute the project. In 2018, the Creative City Challenge takes its cue from the site of installation: The Commons. What is a 21st century commons? What do we share when we gather together in outdoor, physical space? Is it possible to share common ideals and goals while acknowledging significant differences in heritage, lifestyle, income and interest? What do we have in common in a city with significant racial disparities in employment, education and other markers of well-being? Is “common humanity” a hollow phrase or something worth fighting for? Is commonality uncommon? Can there ever be common ground on land that was colonized? What does Downtown Minneapolis have in common with other parts of the city? The suburbs? Saint Paul? Greater Minnesota? What are dreams for the future that we can have in common? We invite you, the creative sector, to explore through installation and programming how creative placemaking can help invigorate The Commons as a site of commonality. We are particularly interested in proposals that use the space of The Commons to encourage engagement, both individually and as a community. The Creative City Challenge is open to any artist living in Minnesota. For teams, the lead artist and at least 50% of the team must live in Minnesota. Entries are accepted until 11:59 p.m. CST, Friday, November 17, 2017 (see entrant information below). A committee of stakeholders will select three finalists by November 21. Each finalist will receive a fee of $2,500 to prepare a final proposal. A separate jury will select the winner based on in-person presentations by the finalists on or around February 6. The commission fee for the selected project is $50,000. The winning Creative City Challenge project will be unveiled and featured at the opening of Northern Spark, an annual dusk-to-dawn festival with tens of thousands of participants, taking place in Minneapolis on June 16, 2018, and will remain in The Commons through October 15. An optional informational session will be conducted on Tuesday, October 17, at 6:00pm at 147 Holden St N, Minneapolis, MN 55405. Enter through the back door. If you would like to get one-on-one feedback about your proposal, please email creativecitychallenge@northern.lights.mn to schedule a 15-minute session between 4pm and 6pm or after the info session on October 17, or 5pm-7pm on November 8. The Creative City Challenge challenges applicants to create an installation that explores the idea of commonality for Minneapolis, its residents and visitors. The Commons is actively used by the general public as a place for respite and activity, as well as a location for large special events, such as Northern Spark on June 16, when the Creative City Challenge will be launched, and the X Games July 19-22. The Commons also hosts a range of other events including community gatherings, company picnics, weddings, and events related to U.S. Bank Stadium. Commonality. How does your project relate to ideas of commonality? Sustainability. What materials will you use to create your project? Are they recyclable and or non-toxic? Do you use renewable energy sources? We encourage artists to consider their carbon footprint and potential waste while conceiving of, creating and implementing their project. Artistic quality. The proposed work must be an original piece by the artist in any medium or multidisciplinary. It can be serious or funny, spectacular or intimate, or any combination thereof. Works that are commercialized or are intended to sell a product will be not be considered. Participatory. How will people interact with your project? Participation can be passive such as following dancers moving through space or participatory data visualization. Nighttime. How will your project operate at night? How will people see your work? Safety. This piece will remain in place for 7 weeks, during the opening festival and other large events. Please consider the safety of yourself, your audience and the artwork. Crowded. Thousands of people attend Northern Spark in 8+ hours, and X Games and U.S. Bank Stadium events draw huge crowds as well. Depending on the location of your project, there will likely be very large crowds to appreciate it. How does your proposal account for this? Accessible. Is this project ADA compliant? As a work of public art, there will be a broad audience experiencing your project who have a range of arts knowledge from novice to seasoned practitioner. At Northern Spark the audience moves from project to project frequently. How will your project be understood by the casual observer? Feasibility. Your project must be feasible to run over the course of 4 months, and installation and de-installation on The Commons must be efficient. Describe how your project is feasible to set up and take down within a reasonable timeframe. Sound. City ordinances prohibit most amplified sound in outdoor spaces after 10 pm. Legal. Projects must meet all necessary city laws, ordinances, and codes. Extensive research about city codes is not necessary for the application. Staff will help with these questions after projects are selected. Durability. The piece must be durable, able to withstand wind, rain, sun, and active animal and human engagement. The Project must be easily maintained and able to endure the whole 2 month term. You must include a thorough maintenance plan and adequate maintenance budget, for stakeholder approval. We will assist and facilitate permitting, electricity, permissions, and other aspects of the project, but artists are responsible for the creation, production, execution and maintenance of their project, including all necessary permitting, and restoration of the site afterward. The Commons is Minneapolis’ newest 4.2 acre public green space. Proposals for the Creative City Challenge should be sited in the western block, outlined in blue above. Site 1 – Part of granite “mitten”, Area 1 on attached map. Available site size approx. 40’ x 40’. We strongly encourage that at least the majority of the installation should be sited in this area. Site 2 – Ellipse lawn, close to the corner of 4th Street and Portland Avenue. Area 2 on attached map. Lawn size 92’ x 60’, 4,192 sf. Available site size approx. 75’ x 45’. Note: All site conditions, including the lawn must returned to the original state, and the grass is a special variety, which is expensive to replace. Fully engineered for climbing, wind loads, etc. Able to withstand daily water spray from irrigation system. Available power – Dedicated 20 amp circuit power outlet located +/- 30’ away. Line to be cable ramped for installation term. The commission for the Creative City Challenge is $50,000. A design fee of $2,500 will be provided to the finalists. Budgets should include everything necessary to present the project from construction to permits to installation/deinstallation to artist fees. Information about 2017’s winning project ORBACLES can be found here and 2016’s winning project Wolf and Moose here. The Creative City Challenge was developed as a project of the Minneapolis Convention Center in 2013, its inaugural year, the Creative City Challenge selected the Minneapolis Interactive Macro Mood Installation (MIMMI) as the winner, Balancing Ground in 2014 and mini_polis in 2015. Proposals are due by 11:59 p.m. Central time on Friday, November 17, 2017. Click here to submit your proposal. If materials are needed in an alternative format, call at (612) 673-2488 or email Gulgun.Kayim@Minneapolismn.gov. Deaf and hard of hearing persons may use a relay service to call Minneapolis 311 agents at (612) 673-3000. TTY users may call (612) 673-2157 or (612) 673-2626. Supporting materials that help us understand better your proposal and that it is feasible. This can range from a sketch on a napkin to CAD drawings, from a photo with a drawing superimposed to a video flythrough. If there is a technical component to the project, make sure to explain it. To the extent possible, give us a sense of the size and footprint of the project. If you have a specific site in mind, state it. Otherwise, what are the characteristics you are looking for, which are important to the project? Samples of past work (Images, video or audio files). We ask for up to 10 images and 2 videos or audio of past, preferably related work. A budget for the total amount you’re requesting for your project. (max 1 page) Note: We will not be evaluating whether you have the best price for the right amount of materials; we want to see that the major budget needs are reasonable. Please note: This sample proposal responds to different project requirements (theme, location, etc.) and is provided to give you a general sense of a winning proposal. You should create your proposal based on the guidelines outlined above. Email creativecitychallenge@northern.lights.mn with additional questions. The Arts, Culture and the Creative Economy program is an initiative of the City Coordinator’s office to leverage the creative sector towards strengthening social and economic growth in the City of Minneapolis. The goals of the program are to provide arts and culture services to City Departments, promote local arts and culture, develop frameworks for 21st century arts economies and collaborate on arts based community development initiatives such as ‘creative placemaking’. 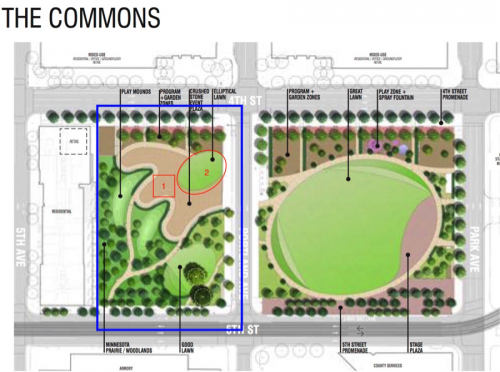 The Commons is a new 4.2 acre public green space in the heart of downtown Minneapolis. Spanning two city blocks, the beautifully landscaped and actively programmed park offers experiences to welcome and engage the community at large. The Commons is located at 425 Portland Avenue S in Minneapolis, across from U.S. Bank Stadium and steps from the Light Rail Train station. Northern Spark is a one-night, all-night participatory arts festival taking place on Saturday, June 16th, 2018 from 8:59 pm – 5:26 am. During Northern Spark, tens of thousands of people gather throughout the city to explore giant video projections, play in temporary installations in the streets, and enjoy experimental performances in green spaces and under bridges. From dusk to dawn, the city surprises you: friendly crowds, glowing groups of cyclists, an unexpected path through the urban landscape, the magic of sunrise after a night of amazing art and experiences. Northern Lights.mn is a non-profit arts organization dedicated to artists working innovatively in the public sphere, exploring expanded possibilities for civic engagement. Northern Lights.mn produces Northern Spark. For media inquiries, please email press@northern.lights.mn.